A plaque commemorates the first McDonalds Family Restaurant in Victoria. In 1973 a time capsule was sealed to mark the opening of the restaurant. 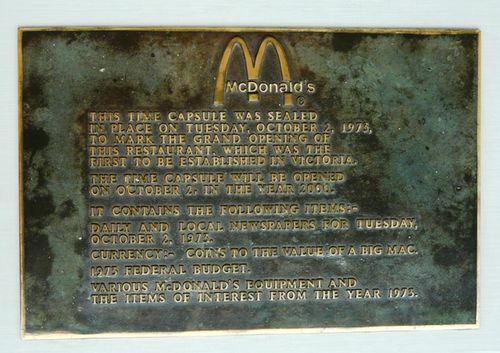 Placed in 1973 to commemorate the opening of the first McDonalds Fast Food outlet in Victoria. The plaque was originally located in the garden bed on the west side of the building in 1973. Because it is now in a different location and inside the building, it may be assumed that when the time capsule was lifted in 2000 as stated on the plaque, it may have then been re-placed in its current position at that point. Alternatively, it may have been located in its present position when remodelling and refitting was done on the restaurant c.2007. FIRST TO BE ESTABLISHED IN VICTORIA. CURRENCY: COINS TO THE VALUE OF A BIG MAC. THE ITEMS OF INTEREST FROM THE YEAR 1973.